What’s better than seeing Elton John in your own backyard on a beautiful late summer night? Someone else winning tickets so they give you their tickets for half price! They were only lawn seats, which explains the less than ideal photos, but still a great score. The rain stopped by 5:00, so while the mud remained, it was a clear moonlit night. We started out the night having been turned away at the gate because our chairs were too tall. They were regular chairs in a bag, that you see everywhere, but it appeared many concert goers had been denied access with their chairs because we could see them littering the sides of the entrance. So we did the same, hoping they’d still be there at the end of the evening, and went toward the box office. On our way, a man holding tickets approached us and asked if we wanted his now extra tickets because he had won better ones. Our new friend walked with us to the gate to guarantee we’d get in, and it we felt like we had won the lottery! Once inside the packed venue, finding a place to stand was a priority. The field was filled with mostly middle-aged concert goers IN CHAIRS, many were of the “too tall” variety. Note to self, try a different line before ditching the chairs. If there’s an overzealous rule-follower working the ticket line, there is probably a rebel rule-breaker as well. 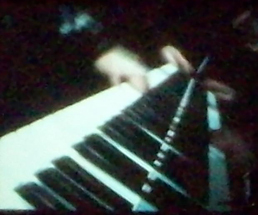 Prior to the Rock and Roll Hall of Fame inductee appearing on stage, we were treated to two young men from Croatia playing rock music on cellos, opening with Michael Jackson’s Smooth Criminal, the song used to promote his documentary movie “This Is It”. They were also members of Elton John’s band and what a surprise they were! 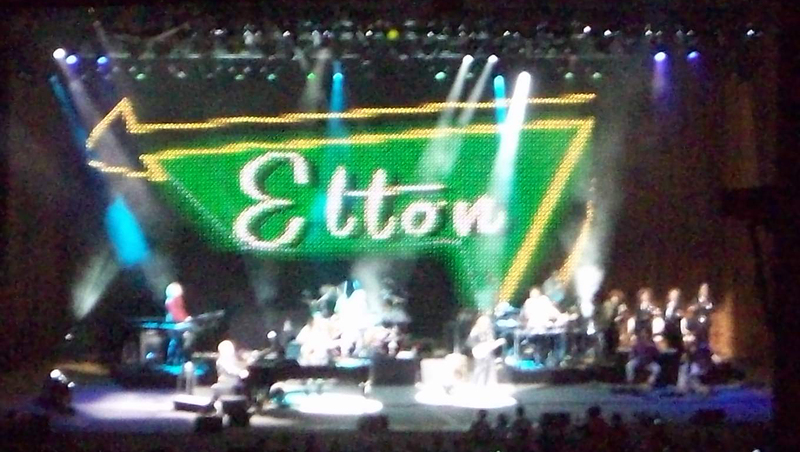 Seeing Sir Elton John is a rather surreal experience, especially at our own home venue. He is after all a music icon, celebrity icon, grammy winner, Rock Hall inductee and world renound philanthropist who sang at Princess Diana’s funeral. Even far from the stage at the back of the lawn (because we didn’t have chairs), he was still larger than life. OK, we were mostly looking at the screens, but the experience was still one to remember. The lighting and images added a hint of 70’s ambiance to the evening. Missing were his 70’s costumes, but several videos replayed those moments, while the crowd cheered. We relived every popular 70’s Elton John hit for 2 hours and 45 minutes, “Goodbye Yellowbrick Road”, “Daniel”, “Bennie and the Jets”, “Someone Saved My Life Tonight”, “Philadelphia Freedom”, “That’s Why They Call it the Blues”, “I’m Still Standing”, “Rocket Man”, “Levon”, a lesser known humorous “Holiday Inn”, three newer songs from his Leon Russel collaboration and more, before his encores. Certainly he can’t be 64! Many artists half his age don’t play for that long! If the opportunity ever presents itself to catch Elton John, jump on it. It’s one of those once in a lifetime moments that you will be glad that you put down the remote, got a babysitter, borrowed a car or whatever you had to do to get there. Now if we could only understand why people go to a concert, pay $40 for a lawn ticket, another $40 on giant beers and talk throughout the whole evening! Wouldn’t it be more comfortable at home on your own lawn? Certainly more cost effective and the restroom lines much shorter!